…and discovers that Liverpool is a city of surprises! Let me take you back to 1974. A little girl, around four years old, is watching the News – on a TV which has folding wooden shutters at either side of the screen. This had the effect of making it look like a piece of furniture when the shutters were closed, which they were in the evening, after Closedown and the National Anthem, to be opened again when programmes began. That could be well into mid-morning in those days, or alternatively when ‘Fingerbobs’ or ‘Mr Ben’ came on after lunch! It’s no ordinary news day. In China, farmers digging a well have discovered First Emperor Qin’s Terracotta Army, which is seeing the light of day for the first time in well over 2000 years. Now, fast-forward 44 years. The same little girl (me!) 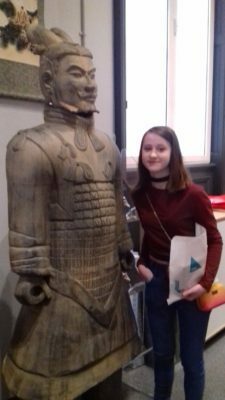 is on the website of the World Museum, Liverpool, hoping to book tickets to see China’s First Emperor and the Terracotta Warriors. I’m not really expecting to be able to fit in a trip…when I realise two tickets for a do-able day are available! One hastily-arranged trip and three trains later, I’m in Liverpool Lime Street Station with my younger daughter Clare – and can’t wait! The first thing to mention is the proximity of the World Museum to the train station. It’s a leisurely five-minute walk, past beautiful civic buildings and the Empire Theatre – making it ideal if you’re on a tight schedule or just here for the day. On arriving at the World Museum, the friendly team direct us to the first floor, but no worries for those with mobility issues, a lift is available – for access information, go to www.liverpoolmuseums.org.uk/wml/visit/access.aspx. Before entering the exhibition itself, there’s a warm welcome from the team, and a short introductory film all about China to get you in the zone. Presented on a 13-metre geometric wall, it’s stunning. A gentle reminder not to get too close to the exhibits follows…although cheeky selfies are fine! Then it’s through a corridor under Chinese lanterns to the exhibition itself. From the moment you walk through the door, this exhibition is genuinely astonishing. 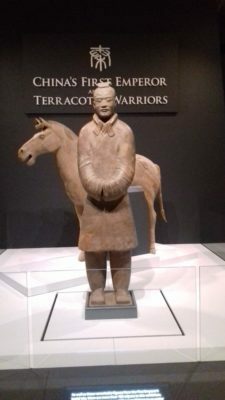 For two thousand years and more, First Emperor Qin’s Terracotta Warriors have lain silent, forgotten and undisturbed under the ground, while life has carried on above. Walking through the exhibition, my initial thoughts were how amazingly well it’s been curated. Whatever your age, level of previous knowledge, or interest, everything is presented so you can appreciate and enjoy the remarkable items on display. 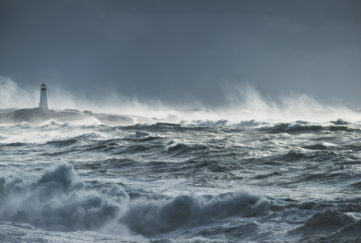 Lots of information is presented, but it never feels overwhelming – it’s very accessible and always super-interesting. 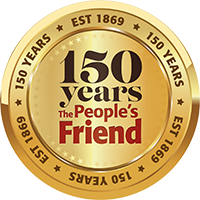 Our very own Wendy Glass has an upcoming feature about the Warriors in our People’s Friend Special 157, on sale May 9, so I’ll try to give you a quick sneak preview without too many spoilers! 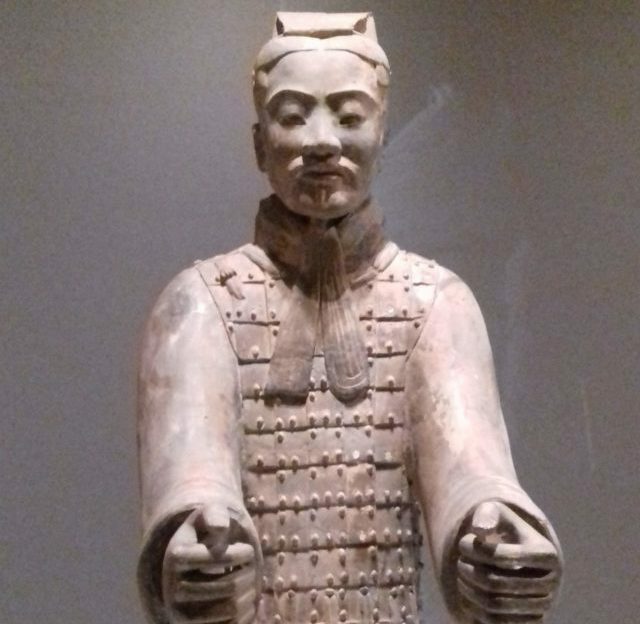 In 221 BC, one man united the warring clans of China to become its First Emperor, giving his name to the new country in the process – Emperor Qin. He united and strengthened China, making weights and measures and currency uniform, creating the Great Wall as we know it, and developing roads and canals to ensure strong travel networks. 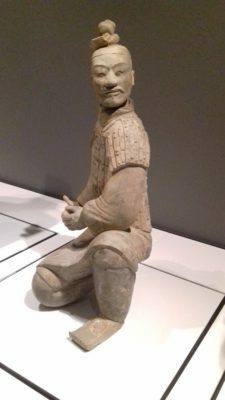 Qin’s belief in the afterlife was so strong that work began on his Terracotta Army essentially as soon as he took power at the age of 13, in 246 BC. He believed the Terracotta warriors would accompany and protect him on his journey to the afterlife and beyond, and huge numbers of the soldiers – current estimates suggest up to 8000 – were buried in his e-n-o-r-m-o-u-s funerary complex with him, along with bronze chariots and terracotta horses, acrobats, birds and musicians. In a parallel with ancient Egypt, it’s thought some members of his household were also buried (alive) with him. Interestingly, it’s possible that Qin’s quest for immortality may have contributed to his early death at just 49, due to the mercury present in some of the medicine he believed to be life-lengthening. He also had a dark side, and many viewed him as a cruel tyrant who crushed opposition, burning books to keep the masses uninformed and throwing scholars into pits. But overall, the sense of this exhibition is positive, focusing on the art and achievements of this era. Clare’s favourite was the stable boy – a picture of serenity and calm. Highlights for me included the chariots, with four horses apiece (and a parasol to protect the driver from the sun); the bronze bells; and the soldier’s helmet (if you’ve seen Disney’s ‘Mulan’ it will definitely look familiar!). The section on the importance of jade – to protect the Emperor in death – was fascinating, and I also loved the little animals, especially the bronze goose; the detail of its foot tucked under is so lifelike. But of course, the warriors themselves are the highlight of this exhibition. Each face is individual, with clues to the rank of each warrior in their height, hairstyle and uniform. Originally painted in bright colours, some flashes of the original paint are still fleetingly visible, and the level of detail and craftsmanship is extraordinary. There’s a modern-day informative piece on how they were actually constructed. And seeing even just some of them gives you an inkling of what a breathtaking sight they must be in their massed ranks in the Emperor’s Mausoleum in China. I hadn’t expected there to be so much to see, and although all tickets have a time slot, we didn’t feel at all rushed – you’re given plenty of time to meander through the exhibits, and go at your own pace. Before leaving, you’re presented with an extraordinary image of how the interior of the Emperor’s tomb, still undisturbed, may appear. As, in the interests of preservation, it’s unlikely the tomb will ever be opened, it’s both fascinating and food for thought – I wonder if we’ll ever know how it really looks inside? After a swift visit to the Exhibition Shop, the next big surprise was that next door to the World Museum is the Walker Art Gallery, housing one of the largest art collections in England. Art spanning over 600 years is on display, and admittance is free. Rembrandt’s ‘Portrait of the Artist as a Young Man’ was a favourite for me – a postcard of which is now surveying the ‘Friend’ office as we speak! Whatever style of art you prefer, there’s something here you’ll like – from Stubbs to Tissot, Rubens to Henry Moore, Renaissance to present day. Time constraints meant that after that, we only had time to fit in a quick trip to the Albert Dock and a run around the (AMAZING) shops – the shopping district Liverpool One offers everything from ultra-luxury to cheap and cheerful, and everything in between! There was so else much to see – top of the list for next time are Tate Liverpool, the Wheel of Liverpool and also the Museum of Slavery. My family are originally from Glasgow and it struck me that the two cities look a little alike, so I’d like to find out more about how slavery impacted both those enslaved and those here in the UK whose everyday lives were in some way touched by it. So surprise number three is definitely what an interesting city Liverpool is. 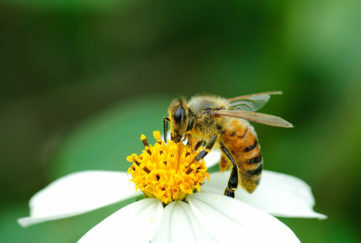 It’s so friendly, and vibrant – the younger members of my family would definitely describe it as “buzzing!”. I can’t wait to come back for another visit. The Mausoleum of the First Qin Emperor is a UNESCO World Heritage Site in Xi’an, Shaanxi Province, People’s Republic of China.